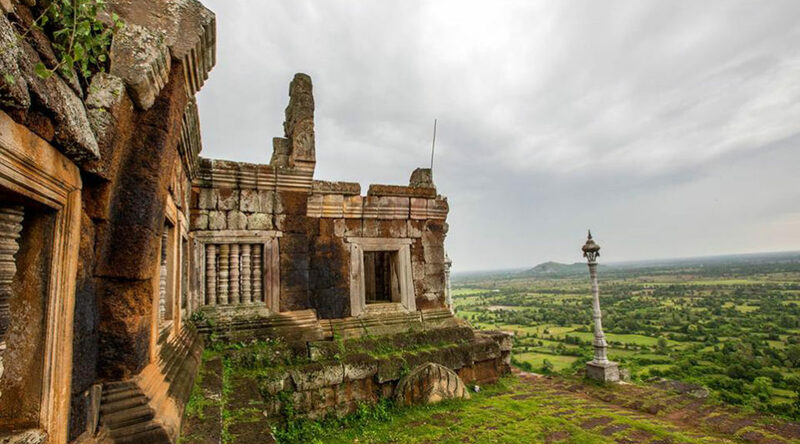 Phnom Chiso temple was built in the early 11th century by King Suryavarman I (AD 1002-1050), who practiced Brahmanism. Constructed of sandstone and other stones, it is 60 meters long and 50 meters wide and sits atop a mountain. The temple is surrounded by two galleries. The first gallery is 60 meters long on each side. The second, smaller gallery, is in the middle, where there is the main worship place with two doors and a wooden statue. There are beautiful sculptures on the lintel and the pillars. Phnom Chiso Pagoda was built in 1917, destroyed by war during the 1970s and rebuilt in 1979. Behind it is a hall called Thammasaphea, kof and a worship place. There is an ancient water tank made of concrete. People usually climb the staircase on the west side of the mountain, which has 390 steps and descend by the south side staircase, which has 408 steps. Another set of stairs in front of the temple links the temple to Sen Chhmos temple, Sen Phouvang temple and Tonie Om, a lake considered sacred by Brahmans and used for washing away sins. 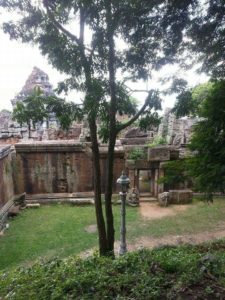 A large rock yard nearby about 100 meters long and 80 meters was once the site of several other temples, but only parts of these temples remain standing. In addition, there is a mountain cave, Vimean Chan, located about 150 meters south of the temple. It is a quiet place for Brahmans or ascetics to meditate. During the Americans’ war with Vietnam, the site was bombed, dislodging several large rocks that block the entrance to the cave today. Hun Sen Phnom Chiso Agricultural and Tourist site is located in Samrong, Bati and Prey Kabas districts. It includes a 513 hectare paddy rice field of dry rice, a 1,386 hectares field of wet rice and three water basins – Thnos Ta Kong, Tuol Lork and Sen Pea Ream. Phnom Chiso is very popular with visitors, especially during festivals, when it is very crowded. The top of the mountain affords visitors a panoramic view of Takeo Province rice paddies stretching for kilometers.